The Barnsley War Memorials Project has now been underway for just over a year (from the official constitution of the group in March 2014) and we have collected hundreds of photographs and transcriptions of local war memorials in our work towards our initial aim of creating a First World War Roll of Honour for Barnsley. From more than 500 war memorials, including over 300 war memorial gravestones, we now have to create a list of unique names - that is we have to work out who each man IS in order to eliminate duplicates. You might be surprised to learn that many men are listed on more than one memorial - and I don't just mean the one in their local church and on their parents' gravestone. It is a particularly common occurrence amongst the officer classes, my best guess being that when a church memorial was being planned and the committee were asking who should be commemorated the names of well known local officers were put forward by the men who had returned and remembered them with fondness and respect. Another problem is a small number of men on each memorial whom we have been unable to identify by the usual routes. Generally a search of the Commonwealth War Graves Commission pages and of Soldiers Died in the Great War (available free on Ancestry in local libraries and on Find My Past as pay-per-view) finds 80% of the men named. A few more are traced by a search of the local newspapers - the Barnsley Chronicle is indexed by soldiers' names to the beginning of 1917 in Barnsley Archives and the whole newspaper is also available digitally to search month by month. The Barnsley Independent and the South Yorkshire Times also provide photographs and obituaries during the war years - these are available to search on microfilm in Barnsley Archives. Sometimes, though, we are just unable to work out who a name on a church or roadside memorial refers to. This is where we need the help of dedicated local researchers. As well as helping collate the lists of names, photographing and transcribing memorials and recently the 1918 Absent Voters' List many of our volunteers have a particular memorial which they are researching in depth - in fact it is often the way that that they were doing this FIRST and then come on board with the BWMP later, offering us the benefit of their local expertise and research skills. I am researching the memorial at St Luke's Worsbro' Common and also the memorial which used to be in St John's Church in the Barebones area of Barnsley, sadly lost when the church was demolished in the 1960s. These parishes are adjacent to each other, and many members of the OH's family (my husband's family) lived in the densely packed houses in those areas. In fact we (the OH and I) lived in that area ourselves until very recently. One man who has been 'causing me trouble', on the St Luke's memorial is J Brannon. 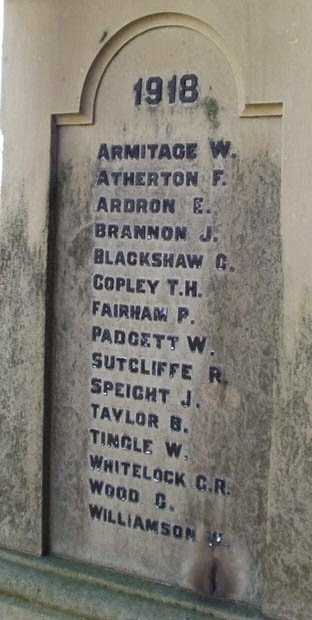 Helpfully the memorial at Worsbro' Common is sorted into lists by year of death, and J Brannon appears on the panel for 1918. Although I have found two Brannon/Brannan families and some miscellaneous lodgers in Barnsley with men of the right age to have served in the war there is only one J Brannon/Brannan listed on the CWGC and SDGW with Barnsley connections. This is a James Brannan who was born in Chesterfield, Derbyshire, enlisted in Barnsley and was reported missing in August/September 1915 in Gallipolli. His parents were Michael and Julia Brannon/Brannan (it depends which census you read) who lived on Joseph Street and Raywood Row in St John's parish in the census returns of 1881, 1891 and 1911. I have found a newspaper report from 1916 where his death in 1915 is confirmed to his mother - still on Raywood Row and from where she is buried in 1925. There is no family connection with Worsbro' Common. At least three men with this surname appear on the 1918 Absent Voters' List in the St John's area. Michael Brannon is his nephew (very likely) and Thomas (probably) and Bartholomew Brannon (definitely) are his brothers - all these men survive the war. If only we had the Absent Voters' List for Worsbro' Common, a man killed in 1918 would appear on it, but unfortunately it does not exist in the same detail as the Barnsley one and is only available at Wakefield Record Office. All this research has not been a waste of time however - as linking the names and places I have discovered along the way have enabled me to make a connection that might not otherwise have occurred to me. In the absence of the actual memorial from St John's I have been working from a list of names published in the Barnsley Chronicle in 1921. Last night I noticed that although most of the names are listed alphabetically that of one of my unknown men on that memorial, James Barman, is out of order. He falls between John Bird and Harry Brown - what if this is a mistake on the part of the Chronicle reporter and the name should be James Brannan? That fits much better in the alphabetical list. 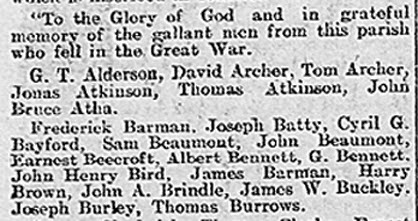 There is a Frederick Barman on the list too - but I found him long ago - he has a younger brother called James William after their father, who would only have been 19 at the end of the war, but a man of that name whose age fits dies in Barnsley in 1962, so that seems to eliminate him. My suggestion is that it is James Brannon/Brannan from Raywood Row who was remembered on the St John's memorial but that he is not the same man as the J Brannon listed on the St Luke's memorial, due to the discrepancy of year of death and the lack of connection to that parish in that Brannon/Brannan family. Which leaves us with the problem of J Brannon killed in 1918, somehow connected to St Luke's, Worsbro' Common. J could be John or James or Joseph ... the search on Find My Past's SDGW page lets me search on J* Brann*n who was killed in 1918 and I have 17 hits to check out. So far none appear to be connected to Barnsley, let alone Worsbro' Common! I have started a new page on the Barnsley War Memorials Project website for listing the men who we are currently unable to positively identify - more will be added as each memorial is merged into our master list. You can access the page via the link I have given or by clicking on the Unidentified Men tab on the website. Please visit our website and take a look - your information could help us identify these men!